An icon of the Lower Paleolithic period (1.4 million to 100,000 years ago), the distinctive tear-drop shaped Acheulean handaxe (pronounced ash-oo-lee`an) has been called the Swiss Army knife of the era. The handaxe was an all-purpose tool that was used for a multitude of tasks that included cutting meat, sawing, drilling holes, digging, and other tasks. Acheulean handaxes have been found over much of Europe, Africa, and Asia; from the British Isles to southern Africa, and from the Iberian Peninsula (Spain/Portugal) to China. The Acheulean handaxe industry is significant because it marks a conceptual shift in the making of stone tools which could be linked to cognitive development in Homo Erectus and early Homo Sapiens. Earlier stone tools were simple pebble tool technology, where a few random flakes were chipped off of river cobbles to form a sharp edge. The handaxe, however, is a shape within a stone. Its creation required many carefully planned flakes to be removed, which modified the entire stone. Furthermore, it is a symmetrical shape that was regulated and imitated over great distances for over 1 million years. Large or small, the same tear-drop shape was produced. This suggests that a mental template was followed, indicating planning and purpose in the mind of the maker, in addition to sophisticated knapping skills. Some scholars have linked the spread of this template across thousands of miles to an increase in capacity for language and communication in early hominids. This particular specimen was collected from the Dordogne region of southwestern France in 1930 by Professor Albert Jenks of the University of Minnesota. It was donated to the Science Museum of Minnesota in 1957 along with a small collection of other Paleolithic material collected by Dr. Jenks from the same region. 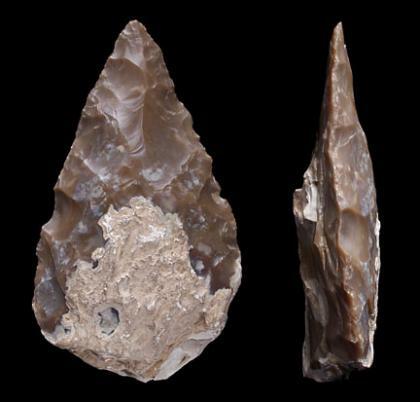 Archaeological evidence shows that the tradition of making Acheulean handaxes reached southwestern France approximately 500,000 years ago and continued for about 300,000 years.